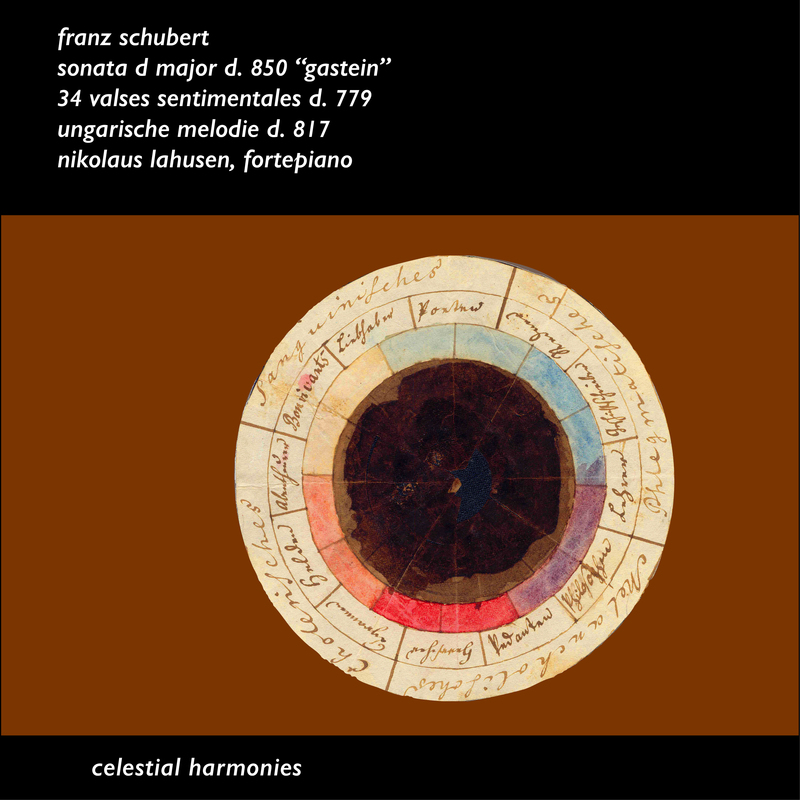 Sonata D Major D 850 "Gastein"
Whereas my first Schubert CD on Celestial Harmonies, Sonata B Flat Major D 930 (13195), dealt with the year of Schuberts death, the present CD thrives in an earlier, more earthly time in Schuberts life. All the works recorded here stem from the years 1824-1825, a period that was for Schubert a happy and productive one, with various trips and hurried stays. The great D major sonata has fascinated and engaged me since my youth. It assumes an exceptional position in Schuberts output. Its radical character and formal conception are unique and closely related, I believe, with Schuberts concern with the allpowerful Beethoven, an influence he was finally to overcome. Virtuosity and the joy of playing the instrument pack the first movement with an energy that climax in stretti and provide the most dramatic and tensionfilled movements of this sonata. Next comes an epic and highly poetic second movement, which takes up once again the energy of the first movement, not in order to still it, but rather to extend it and achieve another great climax. Yet it is the coda of this movement that is the key to the sonata. Just where we expect a further development of intensity, Schubert begins to lead us around by the nose. Tension is suddenly diminished, a dancelike echo of the theme is heard and then it disappears, happy and relaxed. From this point on Schubert finally bids farewell to Beethoven once and for all. He has shown what he can do and goes his own way. And what a way it is! The Scherzo is a dialogue between a crude, clumsily dancing boor in a low register alternating with a tender, gratefully whining soprano in the top. This is interrupted only by a floatingdancing waltz section and a chorallike trio. The coda of the Scherzo resembles the program of the second movement. All tension is released and peacefully resolved. After the energy and tension of the first and in part the second movement has been dissolved, the question remains: what now? And here is where Schubert breaks with all convention. An innocent song is hummed or whistled to an even more innocent accompaniment. Replete with an easygoing joy of life and charm it leads to a stormy first couplet that in turn brings us back to a more ornamented version of the first theme. And then one more great wonder of this sonata blossoms forth: a second couplet in G major. Why does Schubert wait so long to present the most beautiful theme of the entire sonata. I only begin to understand the reason after many concert performances of this sonata. Only at the end of the sonata, after we have left behind all worries, tensions, and struggles of the first two movements and can linger in a joyful mood are we in a position to experience the poetic dimensions of this theme in their full scope. Schubert thereby discovered an entirely new and fascinating solution to the eternal problems of the last movement: not a climax in the dialectical sense, nor a climax in the usual dense and bombastic manner, but a reliance only on the power of a quiet poetry and the melos of an anticulmination. That the movement ends like a musical clock winding down in pianissimo is the radical consequence of this discovery. I always stand in awe before the 200 or more dances that Schubert wrote for piano. What an inexhaustible reservoir of melodies and inspirations! There is hardly another composer who had such a melodic gift. These miniatures are particularly suited to the hammerflügel. Each dance has its own colour, from harps and cymbals to zithers and cembali. Nikolaus Lahusen was born in Bremen in 1960 and grew up in Mexico. His artistic development was supported by Edith Picht-Axenfeld, Christoph Eschenbach and Bruno Leonardo Gelber. Counted among the leading pianists of his generation, Lahusen has given concerts worldwide and has appeared in important concert halls (Philharmonie in Munich, Musikhalle in Hamburg, Beethovenhalle in Bonn, etc.) and with leading orchestras (European Community Chamber Orchestra, Sapporo Symphony Orchestra, Sinfonia Nacional de Argentina, etc.). 34 Valses sentimentales D 779 26'24"
Sonate D-Dur D 850 op. 53 "Gasteiner" 43'38"
37 Scherzo. Allegro vivace 10'24"
38 Rondo. Allegro moderato 9'40"
39 Ungarische Melodie H-moll D 817 4'39"